Sarson ka Saag is a traditional Punjabi recipe made with Mustard greens and other leafy vegetables and a delicious tempering of onion and garlic in ghee. Here is how to make Sarso Ka Saag recipe (Step by Step). What is Sarson ka Saag? Sarso ka Saag or as popularly called sarson da saag is a traditional Punjabi dish made primarily with mustard leaves. Other green leaves like spinach, fenugreek and radish greens are also added to give it a unique flavor and balance the bitterness of mustard leaves. Bathua leaves and spinach leaves are mainly added to balance the bitterness of the saag. If any of these is not available, you can interchange them with each other while making this dish. Sarso Ka Saag is best enjoyed with Makki Ki Roti or maize flour flat bread and is a very popular winter specialty as mustard greens are easily available at this time of the year. This North Indian speciality is quite easy to make and this recipe of mine has been liked by many who tried it. 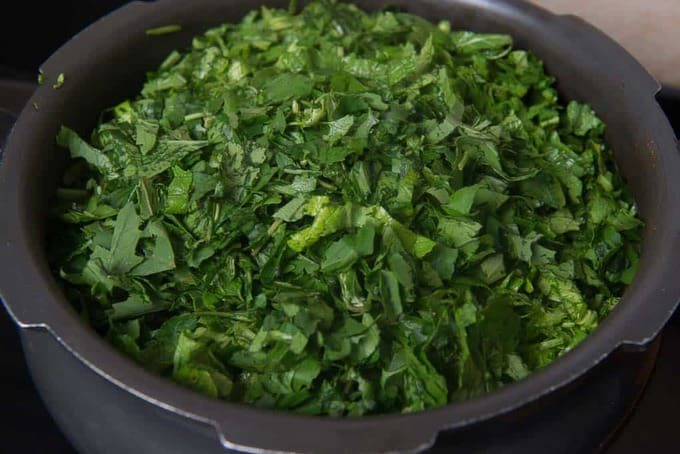 How to make Sarson da Saag? 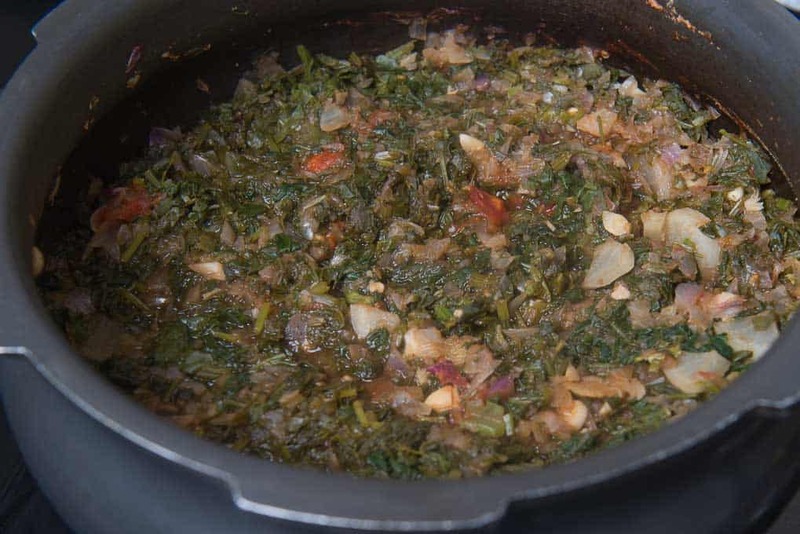 To make sarson ka saag recipe, you have to add mustard leaves, radish leaves, spinach and bathua along with green chillies, chopped onion, tomato, chopped radish and a cup of water in a pressure cooker. Many people think that Mustard Greens and Tomatoes should not be paired together. According to what I have read, I do not see any harm in this but if you still think that it’s not a good idea to pair these two ingredients, then skip using tomatoes. Use any other souring agent like lemon juice etc to give the slight sour taste to the saag. Cook for one whistle on high heat and let the pressure release. 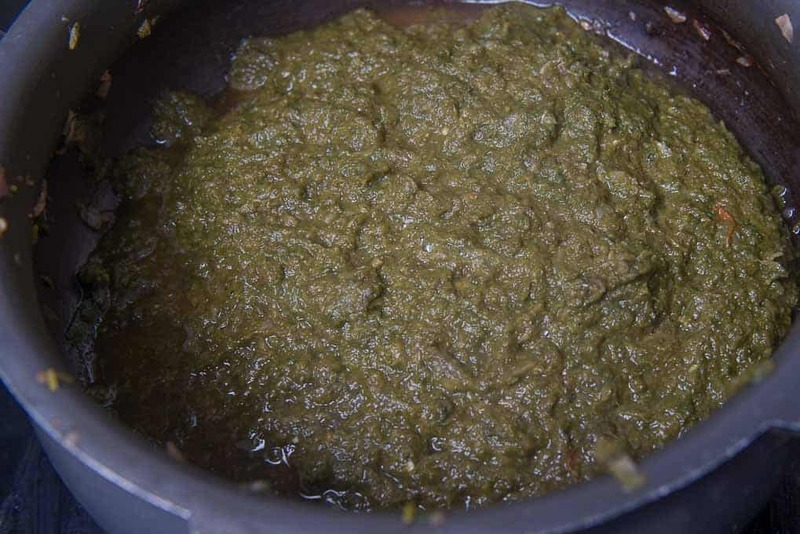 Traditionally the cooked saag was churned using a wooden whisk called Mathani and the process was called ‘Ghotna’ but I personally like the saag to be blended in a food processor to a coarse mix. You can choose the texture you like and decide for yourself which process works best for you. Now add the dry spices and then finally a tempering of onion and garlic finish the dish. 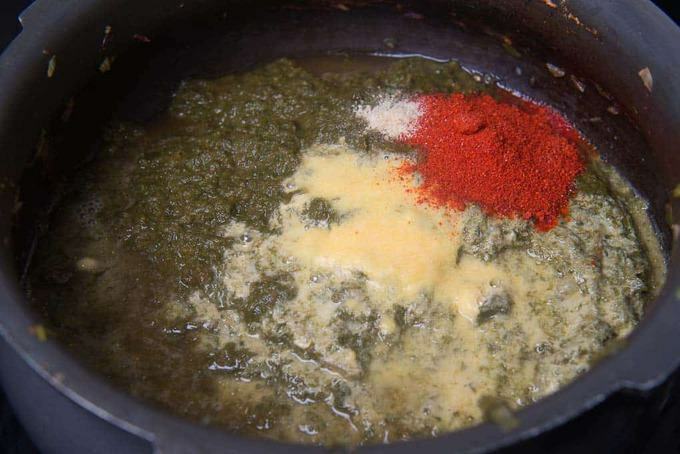 Corn Flour or Makki ka Atta mixed with some water is also added in the saag to thicken it and add flavour. You can also add cumin seeds and garam masala in your sarson da saag and serve it with makki ki roties and white butter. How to clean Sarso ka Saag? Cleaning the greens is a very important step while making Sarson Ka saag. Take a huge vessel and fill it with water. 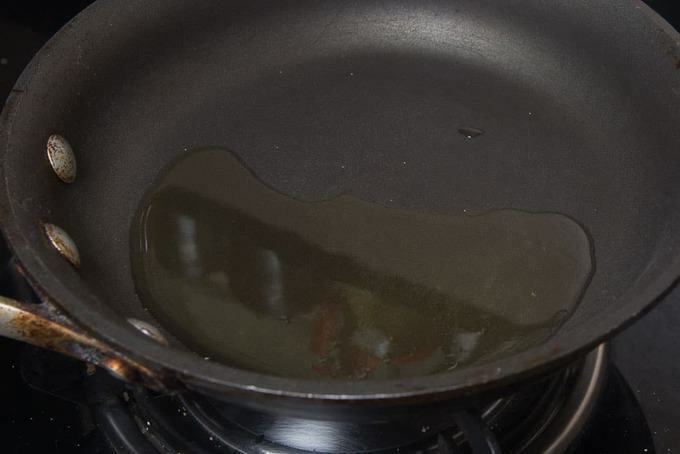 Soak the greens in the water for 2-3 minutes and let the impurities settle down. Then gently take out the greens and discard the water with the impurities. Repeat this process at least 3-4 times until you get clean water. Then chop the greens and use them to cook the saag. I like to do this step one day in advance. It saves me a lot of time when I am ready to cook the saag. How to cut Sarso ka Saag? To make the recipe of sarson ka Saag in Punjabi style, you just have to chop the greens roughly. You will anyways have to blend them to make a paste, so the chopping actually doesn’t matter in this one. But if you are making the variation with no blending, then chop the greens finely. In Delhi, I have seen the vendors do this step for you. The only downside of this is that we have to wash the greens after they are chopped and that takes away a lot of nutrients and taste from it. I prefer washing the greens first and then chopping them to retain the taste and nutrients in them as much as possible. How to make Sarson ka Saag in slow cooker? Follow the same recipe just replace the pressure cooker with slow cooker. Slow cook for 3-4 hours and then blend the saag and temper it. Can we make Sarson da Saag without Spinach? Sarson da Saag recipe calls for a mix of greens with Mustard Greens being the prominent ones. Spinach and bathua helps to balance the bitterness of mustard leaves. You can replace the two and even skip adding them if you like that bitter taste. Can we eat Sarson ka Saag in pregnancy? It is absolutely safe to eat Sarson ka Saag during pregnancy. In fact mustard green shave many nutrients and is rich in iron which will help to keep the haemoglobin level in check. What goes with Sarson ka Saag? Makki ki Roti aur Sarson ka Saag is a match made in heaven. Although this is the traditional way in which sarson da Saag is paired, you can actually have it with any Indian bread and it will taste as delicious. 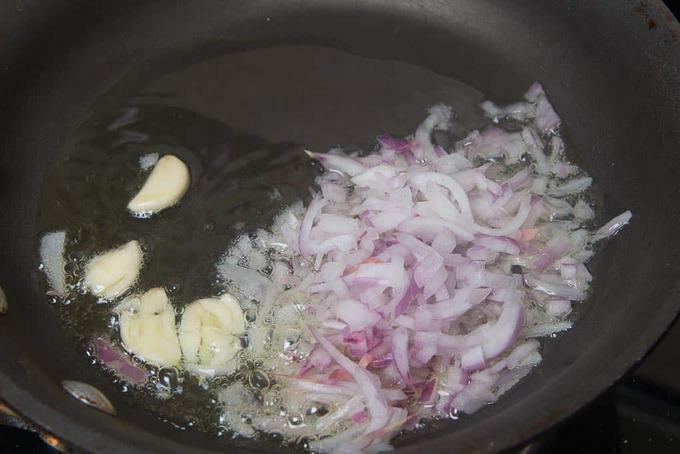 Do not forget to serve some white butter, jaggery and onion along with it. A good drizzle of butter or ghee is always welcome. In case white butter is not available, yellow butter also goes great with it. I also like to serve some mooli ka laccha with this meal. You can add cubed and fried paneer pieces to your saag and make Sarson Ka Saag Paneer. You can add any beans like Rajma or chole to it to make it more filling. Add cooked chicken or mutton pieces to your saag to make non vegetarian version. Keep it as your base and experiment with ingredients you like. Some people also add turnip to their saag. If you are adding turnip, replace it with radish that I have used in the recipe. Turnip and radish gives a nice spicy kick to the salad and are highly recommended. Clean all the leaves and wash them thoroughly. Chop the greens and add them in a pressure cooker. 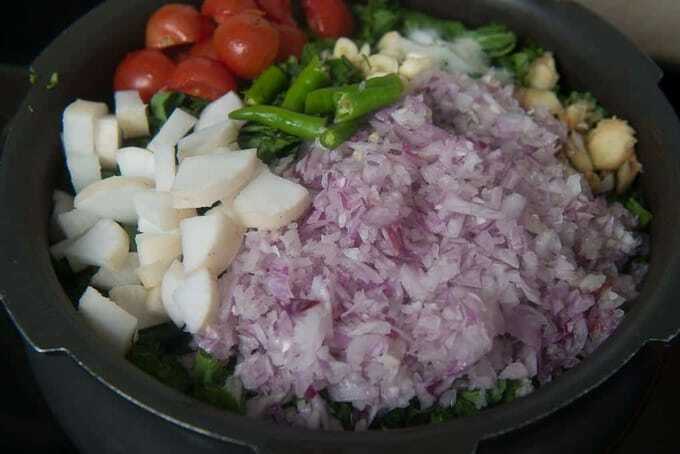 Add tomato, onion, ginger, garlic, radish, green chilli, salt and a cup of water. Pressure cook for one whistle on high heat. Remove the pressure cooker from heat and let it cool. Once cooled, blend the greens in a blender to make a coarse paste. ( I like my saag a little coarse. If you like it smooth, grind the greens till smooth ) Transfer the paste in the pressure cooker. 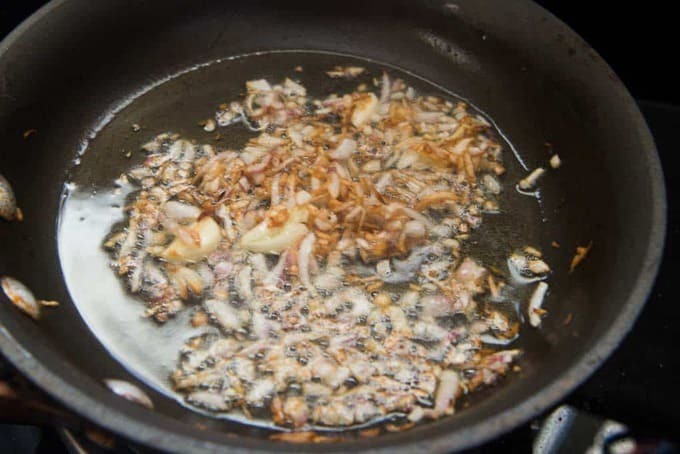 Dissolve makke ka atta in little water and add it in the cooker. Add red chilli powder and hing and cook for 3-5 minutes. Pour the tadka over the saag. 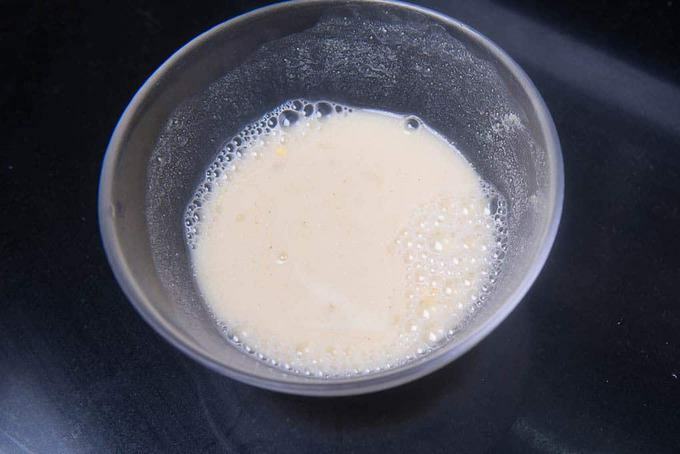 Serve hot with makke ki roti and white butter. Sarson ka saag is a traditional Punjabi recipe made with Mustard greens and other leafy vegetables and a delicious tempering of onion and garlic in ghee. Clean all the leaves and wash them thoroughly. One good way to wash your green is to fill a large pot with water. Dip your greens in water. Let it stay for a minute. All the impurities will settle down. Gently take out the leaves without disturbing the water. Chop the greens and add them in a pressure cooker. Add tomato, onion, ginger, garlic, radish, green chilli, salt and a cup of water. Pressure cook for one whistle on high heat. Transfer the paste in the pressure cooker. Pour the tadka over the saag. Serve hot with makke ki roti and white butter. wow such an flavorful and yummy sarson ka saag 🙂 very tempting !! Looks so so delicious and warming! Lovely pics Neha and very nice presentation. Keep up the good work. Thanx for recipe, looks delicious , traditional punjabi way of making sarson ka saag , my mom makes it like that, thanks for sharing ! Looks delicious. Mind me asking where you got the lovely serving balti and heater from. Thnx Paul. These are from a road side shop in my home town. Where can I buy the traditional Indian serving bowls that are pictured in your photos? They’re beautiful! In India, They are easily available. Please check your nearest Indian Stores and they may guide you. Can you please tell the measurements of each greens in terms of cup if possible?